Your body is very much like a sponge, soaking up bits and pieces of just about everything it’s exposed to — and in our modern world, our bodies are exposed to a lot. From air pollution and food additives to pollutants in our drinking water, homes and even personal care products, the truth is that your body is literally bombarded with toxins on a daily basis. Each woman was found to have up to 60 percent of the 75 chemicals tested in their blood. Among them were chemicals also identified by the CDC study: flame retardants, chemicals from non-stick cookware, synthetic fragrances, bisphenol A and perchlorate. Together, these chemicals represent the “human body burden” — a toxic cocktail of chemicals and pollutants that accumulate in your body over a lifetime and, in time, can take a serious toll on your health. While the CDC states that further research studies are needed to determine whether the levels of chemicals found in most Americans are associated with disease and adverse effects, it is known that many of the detected chemicals are harmful and capable of contributing to chronic disease and other health symptoms. Further, many people now eat a diet of largely processed foods, high in sugar and unhealthy fats, along with consuming alcohol, caffeine, artificial sweeteners and other highly refined food additives. A detox can help your body to rid itself of some of these toxins, naturally, while also giving your body a chance to rest, repair and regroup. In many cultures, including Chinese medicine and Ayurveda, the ancient healing system from India, detoxification has been practiced for centuries, used to improve skin problems, ease digestion and pain, and boost energy levels while promoting the body’s own inherent healing potential. Both your liver and your kidneys (along with your blood, bowel, lymphatic system and skin) help your body process and eliminate chemicals in your sweat, urine and feces. 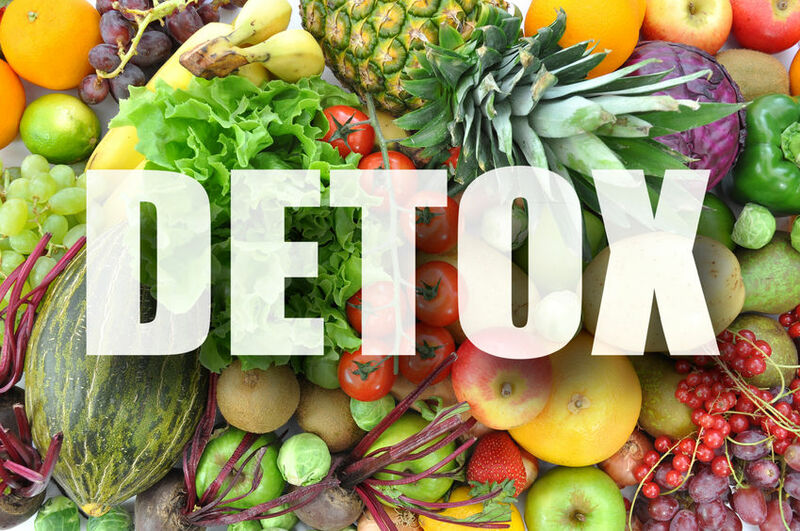 Detoxing can help to support and enhance this natural process. Your liver has an incredibly important job, especially when it comes to detoxification. Along with filtering your blood to remove toxins, your liver uses a two-phase enzymatic process to break down chemicals. During phase 1, toxins are neutralized and broken into smaller fragments and during phase 2 they are bound to other molecules, which creates a new non-toxic molecule that can be excreted in bile, urine or stool. In order for this process to work effectively, your body must have the proper nutrients. If your body is lacking, the phase 2 process may not work adequately, which can leave toxic substances to build up in your system. Most often, people experience detoxification-related health problems because they have a rapid phase 1 process but a depressed phase 2 function that leads to toxin build-up. Glutathione, found in avocado, watermelon, asparagus, walnuts, fresh fruits and veggies. Nutrients that increase glutathione levels include n-acetylcysteine, cysteine and methionine. Generally speaking, eating a high quality, whole foods diet that includes ample healthy sources of protein, fresh fruits and vegetables, and antioxidants will be beneficial for your liver. Further, be very careful about embarking on a detox that involves extensive fasting or restrictive long-term diets of only fruit, vegetable juice or water. While some claim fasting can be potentially beneficial in the short-term if you are healthy, in the long term this can lead to nutritional deficiencies, slower metabolism, and even health damage. Also, because your body requires nutrients to detoxify properly, fasting may lead to a depletion of these vital nutrients. A gentle, natural approach is often safest for detoxification, and will also be incredibly effective at cleansing your system. Research suggests that silymarins, a group of potent antioxidants extracted from the seeds of milk thistle, have antioxidant properties several times greater than that of vitamins C and E. Of the silymarins, silybin has been shown to be the most effective in promoting liver health, which is why you’ll want to look for a supplement with a high percentage of silybin. Fruits and vegetables are excellent sources of fiber that will help move waste through your system. Brown rice and whole grains are also effective. For added fiber, you can also try psyllium seed husks, which will help you to maintain regularity. During your detox, be sure to eat plenty of naturally detoxifying foods. All fresh fruits and vegetables apply, but foods rich in sulfur will be especially beneficial. Sulfur-containing compounds are known to help your liver detoxify environmental toxins, including prescription drugs and pesticides. During a detox it’s especially important to eat only organic foods, as this will reduce the chemical load on your liver. Likewise, you’ll want to steer clear of foods and beverages that are hard on your liver, including alcohol, smoked and cured meats, overly salted foods, high-fat foods, trans fats, and fried foods. Do as much as you can to reduce your toxic load by choosing natural cleaning products for your home and natural personal care products for your body. Be sure your drinking water is free from contaminants and consider using an air purifier in your home, especially if you suffer from allergies or live in a high-traffic area. And remember, stress is a form of toxin, too, which will slow down your body’s elimination processes. So focus on healthy forms of stress relief, relaxation and positive emotions during your detox. Your body depends on water to help your cells eliminate waste and your organs flush out toxins, so it’s imperative to stay well hydrated during a detox. Be sure the water you’re drinking is pure and remember that if you’re thirsty, you’re probably already dehydrated. Sipping water regularly throughout the day, so you stay hydrated without feeling thirsty, is a good guideline to follow. Your skin is an important route of elimination, and your body is capable of removing many toxins through your sweat. Vigorous exercise can help your body to sweat more while also enhancing circulation (as an aside, dry skin brushing may also help you to eliminate toxins through your skin by opening up and clearing out your pores). Along with a regular exercise program that encourages sweating, you can also experiment with yoga, which has specific poses designed to facilitate detoxification. Detoxification is not appropriate for pregnant or nursing women, however most others can benefit from a detox one to four times a year. Traditionally, this is done at the changing of the seasons, for instance at the end of summer/beginning of fall or, particularly, as winter transitions into spring. That said, a detox can be done at any time of year and if you’ve been thinking of giving it a try, there’s no time like the present. Carpe diem!